There are two things I think every millennial needs in their kitchen: a FoodSaver and an InstantPot (but I'll talk about the InstantPot on another day, because I am more than obsessed with it). I think I could probably function with these two items as my only kitchen appliances - yep, that's right. No pots, pans, baking sheets - maybe just a singular knife and a singular spoon. Maybe I will try this for a week and get back to you. But, in all honesty, you do not need a ton of fancy or expensive appliances in your millennial apartment kitchen. What you do need, however, are tools that are going to make it quick and easy to cook for one, and the FoodSaver is one of those tools. You need a food saver for two reasons: 1) It will save you money and 2) It makes cooking for one so much easier. Let's start from the beginning. What is a FoodSaver? A FoodSaver is a brand of vacuum sealers, which is a type of kitchen appliance that helps you to - you guessed it - vacuum seal your food. They are particularly useful for improving the quality/prolonging the life of freezer food, but have countless other uses as well. I highly recommend you watch FoodSaver's 0:54 second video to see what it looks like in action! I became a dedicated freezer user well before I got a Foodsaver for Christmas (enjoy your glimpse into a millennial foodie's list for Santa). There's simply no other way to cook for one (or even two, or cook for one and have leftovers for lunch the next day). Meat, for example, comes in packages larger than one or two servings. You can save even more money by buying in larger packages. Additionally, for safety reasons, raw meat should be cooked within two days. While you can cook your entire package of chicken, then you have to use it within 3-4 days. That can get boring, repetitive, and lead to more waste (both in food and in money) if you don't eat it in time. Plus, it's annoying to have to be running to the grocery store every few days to resupply on protein. Using the freezer (and, therefore, the FoodSaver) allows you to push your grocery shopping to once a week, and protein shopping even less often - I buy most of my meat once a month (or even less frequently, depending on sales). I save everything in individual portions, so it's super easy to defrost - if I want chicken for dinner, I don't have to worry about defrosting a pack of 6 chicken breasts, I can just defrost the one that I individually sealed ahead of time. Or my packs of 4 shrimp. Or my packs of deconstructed rotisserie chicken. I love my packs! In addition to freezing meat, I also use my FoodSaver all the time for leftovers and ready-to-go dinners. It's super easy to freeze single-serving portions of something like eggplant parmesan or lasagna, and you can even reheat it in the microwave right from the sealed bag. My Freezer Friendly Mexican Stuffed Peppers tasted 10x better once I switched over to my FoodSaver from just regular Ziplock baggies - frost bite isn't tasty. It's also great for saving ingredients too - I usually use about 1/2 a can of beans or legumes in my recipes, so I can save the other half in the freezer for the next time I'll need them. I've done this a million times with black beans when I make fish tacos and noticed zero taste difference when frozen, plus you can defrost them in the freezer bag in the microwave - minimal mess, and super quick! I have yet to try this, but people also rave about freezing various cooked grains, which would be great to have on hand as a base to any soup, salad, or meal. In this case, the elimination of frost with the FoodSaver prevents any problems with your grains getting water-logged and soggy when defrosted. Beyond the freezer, there are even more uses for the FoodSaver. I love having fresh parmigiano reggiano cheese to grate over a simple dish of pasta, but I was never able to use a full block before it went bad until I started vacuum sealing it. Now, I can use and reseal a block of cheese and enjoy a slight splurge on a simple meal but feel good about not being wasteful! 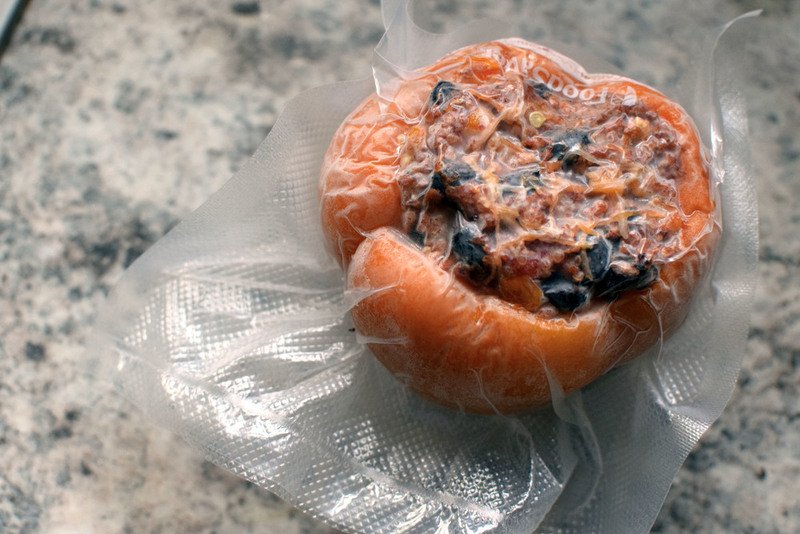 Another favorite is vacuum sealing muffins. I can never eat a whole dozen (I mean, I could) before they go stale, so the vacuum sealer is a perfect way to always have a grab-and-go snack on hand. I have been enjoying Cookie + Kate's Healthy Banana Muffins at work and they taste like I baked them fresh this morning! FoodSavers also have two literally magical features: resealing a bag of chips (you can just use the seal function without vacuuming) to prevent them from going stale and resealing a bottle of wine (!) with the truly miraculous FoodSaver Bottle Stopper attachment. I have yet to try this but am dying for some info on it so please try this out for me! There's also plenty of options to vacuum seal dry goods for your pantry. While I have yet to truly branch out and explore all of the possibilities of vacuum sealing, there are entire blogs dedicated to this stuff. Get some more inspiration with 40 Ways to Use Your FoodSaver. About the bags. So the FoodSaver does require special bags, which are more expensive than traditional Ziplock baggies, but they are well worth the cost. There is a wide range of sizes, from quart to gallon to rolls that you can customize your bag size on. At first one of my major qualms about investing in a FoodSaver was that I would have to buy the special bags all the time and this would be a huge cost to me. This was not the case at all, and I have yet to re-stock from my post-Christmas Buy One Get One Free Sale purchase. Since I'm cooking in single servings, mostly, and do a good job of planning ahead to maximize using my ingredients, I don't use an unreasonable amount of bags to make the cost a significant drawback. Plus, the bags have so many other perks. 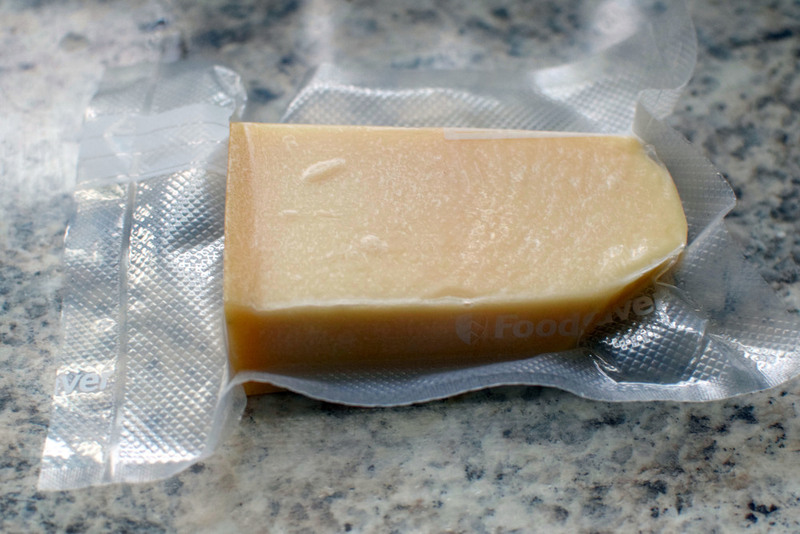 They're more expensive for a reason - unlike traditional Ziplock baggies, which have only 1 layer of plastic, FoodSaver bags have 5 layers, making them much more likely to keep out frostbite, bacteria, dust, you name it. Their durable quality also means you can put food in the microwave to heat/defrost/cook (cooked food only, not raw meats) or place the bags in hot water to boil (would be great for cooked grains!) - good luck doing that with a traditional Ziplock baggie! While using plastic bags in the freezer also works, I was thoroughly impressed by the improved quality of my food once I started using my FoodSaver. It is 100% worth the start up cost, because it will save you money in the long run - you'll be more likely to want to eat your food because it tastes good, instead of like it was sitting in a pile of snow, and because it makes it easy to always have a healthy meal option on hand. Before my FoodSaver, I always worried about using the food before it got too frostbitten. Now, I've enjoyed delicious, fresh-tasting shrimp a month or more from the date I froze it. While food lasts indefinitely when stored at 0°F in the freezer, the quality decreases with time. 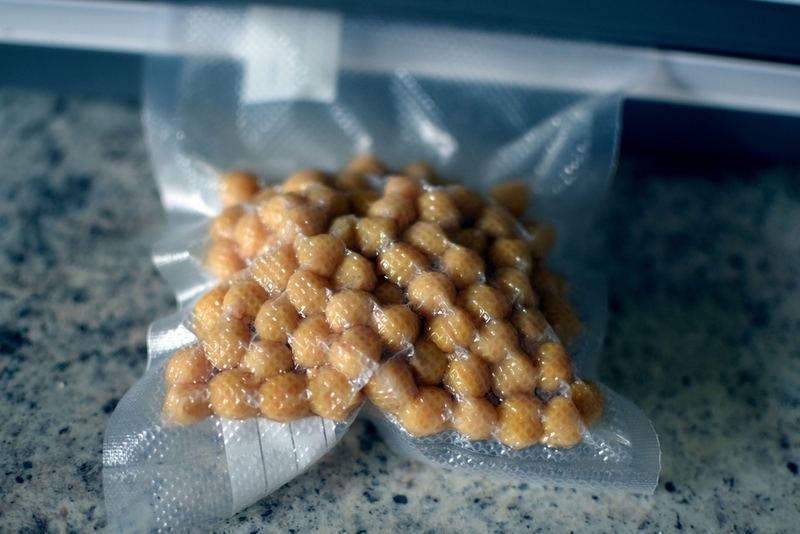 FoodSaver extends the freezer quality of your food from months (in plastic freezer baggies) to years (in FoodSaver bags). I still eat it within months, but if needed, it's nice to know I could survive the zombie apocalypse without needing a grocery run. "ALRIGHT, YOU'VE CONVINCED ME. WHERE DO I BUY ONE OF THESE THINGS?!" Here! The model I recommend is about half a version newer than the white model that I have, but it's essentially the same. The price dropped $12 in the time it took me to write and edit this post, so the $59.99 price point is a crazy deal, since it includes a starter pack of bags (3 quart bags, 2 gallon bags, one 11x10 inch roll) as well as the accessory hose. There are fancier, more expensive models out there, but I really like this one because it's simple, compact, easy to store and fit in an apartment kitchen, and a good price. I've found I only need two kinds of bags, the quart bags and an 11 inch roll to customized the bag size. Stay tuned for a post coming soon about How to Maximize Your FoodSaver and How to Make Freezing Your Meat Easy, which will heavily feature the now-fabled FoodSaver! Note: This post contains affiliate links for products I recommend. That means if you click on a product link in this post and choose to purchase the product on Amazon, I earn a commission. I only recommend products I use and love organically. This means that if you are going to purchase a product that I recommend, I encourage you to do it through the direct link from the blog so that I (and the blog) benefit.